Discussion in 'Poker Chip Advice' started by gmunny, Nov 13, 2006. Hopefully this post will help some newbie chippers (which I still am a newbie, too, but thanks to great sites like this one, the chipboard and tons of others, I'm learning something all the time). One of the first things I realized after starting my collection was how the heck do I organize and store them. Not counting poker chips, I have amassed somehwere in the neighborhood of 40-50 chips in just a few months. I am sure there are many experieced chippers that have thousands of chips! Originally I kept mine in a cardboard chip box and some in these plastic flips the chips just happend to be mailed with. I also had some of my nicer chips in air-tites. It occured to me that this wasn't going to cut it. After visiting a few sites, reading a few articles, I made my first big purchase in storage materials from air-tite.com. I decided that most of my chips were going to get stored in Card Board Mylar Flips, the 2.5"x 2.5" size. At first, I didn't even know what these were. Of course I've seen them, just didn't know what they were called! The flip is basically a rectangle shape and you fold it over in the middle. They also come in 2"x2", but to me the window was too small. With the larger 2.5" size, you can see the chips really good, including the sides. One thing to note, larger 43mm chips barely fit in the regular window. These were pretty cheap, $4.95 for 100. One thing to note, I don't staple the flips, I use cut up stips of avery folder lables. Every now and then, I like to take my chips out and actually hold them. So thanks to a tip on Tyrus's site (see link below), I decided to tape only the bottoms, which will leave me room to take out the chips on the side. One thing I noticed is that chips left upright in boxes, kind of sag in the flip using this method. The ones in the binder pages, didn't do this, however, probably cause they fit snugly in the pages. If someone has a better method, please let me know. UPDATED 9/07> As far as the window sizes for the 2.5" flip, I used the 44mm or 1.75" for regular sized chips (see right chip below) and the 50mm (2") flip window for larger/oversized chips (left below). To store my flips, I was thinking I would store some in binders and eventually if I accumulated a lot, I'd also put them in storage boxes. I've received many chips in these. These are great for short-term storage, but beware of the PVC in them and don't store chips in them long-term. See my PVC note in the Binder Pages section below. The flip box is a good idea if you want to store a lot of chips. I'm not sure how many it holds, but it is a lot. It's about the legnth of a shoe box. The only problem with getting 2.5" flips, was you only had one choice on the box. This one was $6.95 for a double row box. For the binders, I picked up 12 pocket vinyl pages, which were .60 per page or 25 fpr $11.95. Make sure you get the ones that fit the same size as your flips. After a few months of use, using binder pages is by far the easiest method of looking at your chips. You can look at the front and back of all chips. It's great! One note about Binder Pages, I used to have a few chips that store directly in the binder page (i think it had 20 pockets on one page), but I read that if the pages have PVC in them, they can actually ruin a chip if stored for a long time. I guess there can be some color transfer on clay chips. This is one of the reason's I went for the coardboard flip method. If you don't want to buy flips, I think there are non-PVC binder pages available but I'm not sure where to get them. Also from a tip on Tyrus' site, instead of buying a fancy padded binder, I bought a binder that zipped up. This was so in case a chip did fall out of the page, it didn't fall out of the binder. I thought this was a great idea, especially if you think you are going to travel with it. I bought this one for under $15 at target. You can basically get the "Direct Fit" or the "Ring Type" air tites. The Ring Type have a styrofoam ring around the outside of the chip and the "Direct Fit" doesn't have a ring. I opted for the "Ring Type" air tites becuase all chip manufactures had slightly different chip diameters, which became really evident after I had a tough time getting one of my chips out of a "direct fit" air tite. I bought white and black rings at .48c per. These are totally unnessary, but they looked cool on the website, so I wanted to check it out. The box was $3.10 and a 5 pack of display cards were $1.20. I got all black cards and one side has a type of velour material on them. Here's a pic of a chipbox I use to store loose chips. You can frame your chips. Make sure to keep out of direct sunlight or else they made fade. A lot of good info on the faq, too. See 2005 Buyers Guide to Casino Collectibles on CCGTCC site above. There may be other storage solutions, but I think I hit on the main ones. This is an awesome thread gmunny! I have started amassing a few chips since I started collection and have been wondering what I should do to start storing and organizing them. 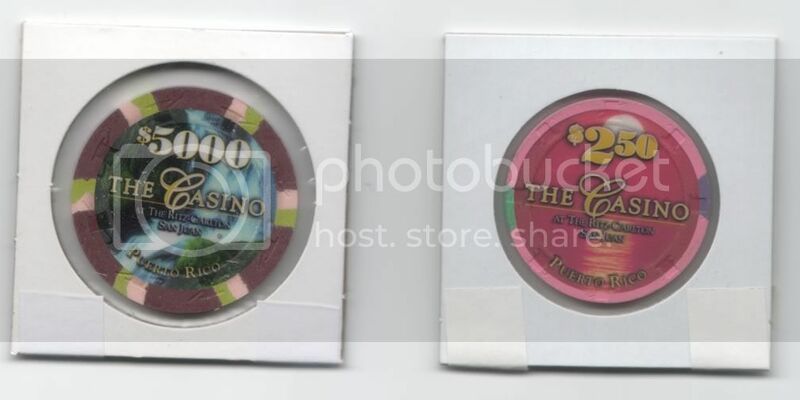 I have one of the Casino Chip Binders and had no idea the PVC could ruin these chips for long term storage. Thanks for the heads up and a great post! Most excellent post. Look for this one to become a sticky, or at least linked in the FAQ sticky!! Good job. I love to see posts like this in the Collector's Corner. I agree...great post. It should be stickied, or put in the reviews section, or something! This Post is flippin fantastic. Thanks for the photo documentation and the time and effort! Great post. +rep coming your way. I have been storing my chips directly in vinyl binder pages. I'll be doing the mylar flip & binder page thing as soon as my order gets here (after I place it today that is ). Great post, and yes it does help. I have around 80 chips that I would like to get squared away. Been wondering what the best way would be. I'll probably do the cardboard flips in a binder. So who's going to organize the GB for supplies? Rep-worthy article, G. I've been thinking about moving my collection from their current airtites to a binder; I like your idea of using a zippered binder. I read somewhere about a binder that can hold airtites, I might go for that one. Good job. Thanks for all the kind comments and reps! I really appreciate it! You can read more about it on the link in my original post above. Someone had some bleed. Other don't. My opinion is that you can never be too careful with your babies! But no trouble with the clear mylar? Great post! Storage solutions for collections are THE question for many collectors. You seemed to have the major types represented. Excellent post! I've been collecting and storing chips for five years and am seriously re-thinking my current setup thanks to your post. G, I meant to ask you: how many pages can your binder hold? Excellent post thanks for the info.